“Watch and wait” has been a mantra for patients with asymptomatic CLL and indolent lymphoma for quite a few years and sometimes no explanation is enough to comfort a patient who is understandably worried about their new diagnosis (see: when to treat CLL, choosing first treatment in CLL, and how I treat follicular lymphoma part 1). Quite a few people have dubbed this “watch and worry” instead of watch and wait. There is an avalanche of messaging out there about early detection and early treatment saving lives in so many cancers that watch and wait can sound more like medical quackery than good science. For some patients, taking a nutritional supplement and avoiding chemotherapy is an easy sell – but for others, the thought of living with untreated cancer is too much.The short answer is that CLL and low grade (indolent lymphoma) are different than a lot of solid tumors – but this blog is about the long answers – so here goes. Historically, the argument in favor of watch and wait was that our treatments did not impact overall survival – so why take chemotherapy unless you needed to get rid of some bothersome symptom. We would argue that chemotherapy was a steep price to pay if it didn’t do you any good in the long run (see risk stratification in CLL). Admittedly, those conclusions were based on studies from the 80’s and 90’s that used fairly ineffective treatments or drug combinations with moderate to significant side effects of their own. But science continuously evolves. Several recent studies have shown that IF you are going to treat CLL, certain treatments may improve survival compared to others (FCR better than FC, Fludarabine better than chlorambucil). While this later observation does not indicate that treatment is better than NO treatment, now that we know we can improve survival with some of our treatments those old assumptions need to be retested. In follicular lymphoma (which is a model for many of theindolent diseases), an ongoing study already presented at ASH compared rituxan to observation. Not surprisingly that has shown that patients who get rituxan are generally able to wait longer until their next treatment compared to the folks who were randomized to observation – not necessarily an earth shattering observation. Whether this approach influences how long patients actually survive remains to be seen as that will take quite a few years for the study to collect data. While the data from that study continues to evolve, others have pointed to the SAAK study in which eight doses of rituxan were given over nine months (weekly x4 then every other month x4) and note that nearly 40% of patients have not required any more treatment over the next ten years. It is possible that early intervention may be better, but we really still do not know. I suspect the data will look different from those old studies now that we are using drugs like rituxan that are both effective and well tolerated – but whether that means you live longer has yet to be seen. In CLL however, single agent rituxan doesn’t pack the same punch as it does in follicular lymphoma. There is less of the CD20 target on the surface of CLL cells than there is in follicular lymphoma. Furthermore, CLL has some tricky ways of lulling T cells to sleep (anergic). Interestingly revlimid may help wake those T cells up (not FDA approved for this indication and should be done very carefully as there have been reports of tumor lysis syndrome). Along comes a new paper though that I think has profound implications on how we thing about managing ANY of our patients with ANY lymphoid cancer. I’ve written several times on clonal evolution (here and here) because I think CLL highlights this principle better than just about any other cancer and may actually have lessons for metastatic breast cancer or other solid tumors. I realize that I’ve probably been trying to write about watch and wait in these posts but never really put it into the right context – so here goes. Ok, so you have waited twelve months without doing anything to the brown mess. Go out back again and tell me what is growing. Is it a lush green yard with a few scattered weeds or is it a mess of ugly weeds. Chances are, you will have a bunch of mutant dandelions that have totally taken the place over. In SOME cases – that example MAY illustrate the effect of chemotherapy on CLL on the “clonal architecture” surviving cells. In evolutionary biology terms, we may refer to effective chemotherapy as a “mass extinction event” – think asteroids and dinosaurs. Any time you have a mass extinction event in a biologic system you may see “survival of the fittest” play out right in front of your eyes. In our example above, the reason the dandelions didn’t run amok before the round-up was that there was a lot of grass competing for the soil, water, etc. You could say that the grass was the dominant (incumbent) clone holding the dandelions back. Once you cleared out the grass though, the weeds had plenty of room to take over (boy with weed and grass both in this post – really curious to see what sort of google searches land on this page). In this prior post, I highlighted a paper that followed a single individual at several time points and showed how there were three separate subclones at the time of diagnosis. Before FCR chemotherapy there was a small subclone (1% of total cells) with a bad mutation. After chemotherapy, that clone which was the “fittest” took off and became the dominant clone and ended up being the one that caused the patient to pass away. This example has been replicated in a few other papers too so I think it has some validity to it. I often tell patients, “bad” may be a good enemy of “worse.” Yes, having indolent lymphoma or CLL may be a bummer, but it may be better than having a super mutant, chemotherapy resistant, transformed beast come back at you. I have often been puzzled by studies that show a dramatic improvement in “progression free survival” that have zero impact on “overall survival.” In other words, treatment “x” does a better job keeping your disease away than treatment “y” but ultimately you both pass away at the same time – huh? Maybe the better treatment is beating the disease back further – but also selecting for a more resistant set of cells to come back when it does come back. In the paper I referenced above that shows how “clonal architecture” can change over time, one of the most interesting findings to me was that the presence of a “subclonal driver mutation” generally predicted for a shorter remission duration and the emergence of resistance. “Subclonal driver mutations” are a lot of the bad markers we’ve been describing in other posts such as BIRC3, NOTCH, SF3B1,P53 etc. but that these mutations are in a very small population of the cells. In other words, you may only have 3% of your cells that are really smart (ie P53 mutated) and 97% of your cells that are generally dumb (del 13q), but that 3% of cells are the dandelions. Your chemo may make your numbers look a whole lot better and even make you feel better, but now you’ve traded the devil you know for the devil you don’t know – and that second devil might be really nasty. Newer sequencing technologies are about to enter the clinic and help us find these “subclonal driver mutations” with vastly better skill (though there will still be limitations on how well we can look). I HYPOTHESIZE (though this is absolutely conjecture and should not be taken as settled science) that in 5-10 years knowing the full clonal architecture will influence our recommendations surrounding watch and wait. With all this in mind, I think it is easy to take the "watch and wait" strategy too far. Some folks will do anything possible to avoid treatment and get themselves into a deeper hole than they need to. Sometimes with a slow disease, it can feel like you can just wait it out a "little bit longer." For low grade lymphoma there are criteria for treatment. In CLL, I've written about "when to treat" which is my summary of the IWCLL guidelines. The caution here is that you can get yourself a lot sicker than you need too if you hold things off for too long. I would wager that it is even quite possible to feel a lot sicker from the disease than from some of the treatments available. I've seen quite a few patients literally feel A WHOLE LOT BETTER after starting treatment that they had delayed longer than they should have. 6) Watch and wait is not crazy in appropriate patients – there may have been benefit to it for a long time that we are only just now starting to figure out. 7) Patients should not wait too long otherwise they just feel lousy when they could have been feeling better with treatment. 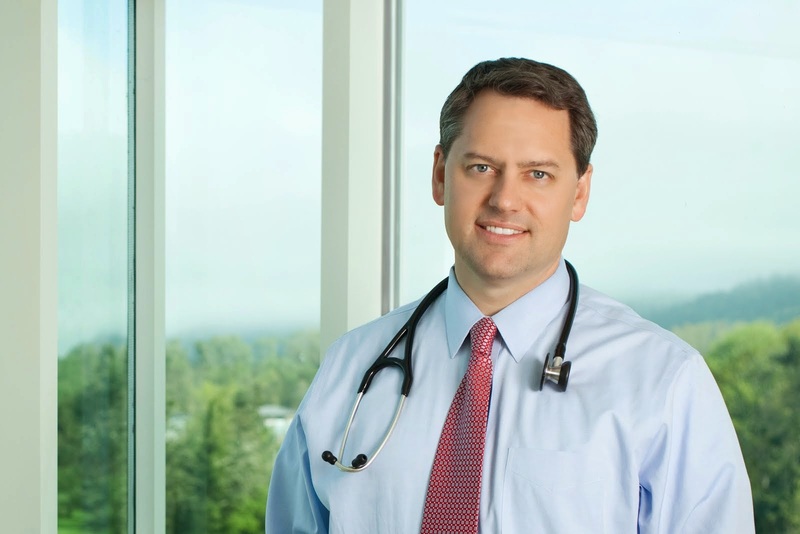 I am a hematologist oncologist practicing at the Willamette Valley Cancer Institute in Eugene Oregon. I am also the medical director of hematology research for US Oncology a community based research network with sites throughout the United States. The purpose of this blog is to serve as a resource for the patients I see every day. In our visits, I often find I want to give a more comprehensive discussion than what time allows. I hope this blog allows my patients to feel more informed about what we are doing and why we are recommending it.